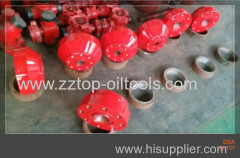 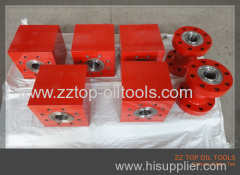 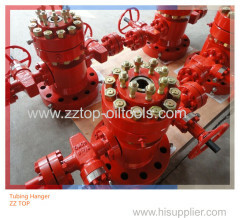 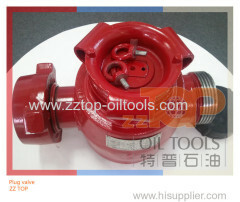 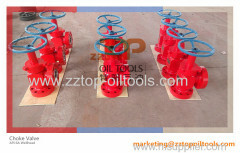 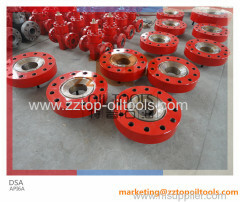 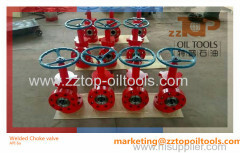 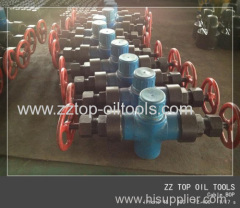 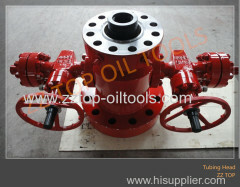 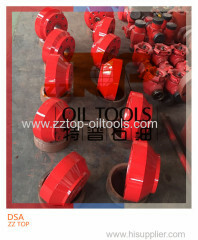 ZZ TOP manufactures the well control and wellhead equipment conformed with API 6A, API 16A, API 16C for oilfield service, including BOP, X-tree, various flanges, adapter spool, riser spool, etc. 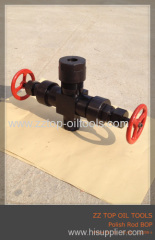 API 6A Ajustable Welded Choke Valve 2 9/16" 3000# WP Manual Choke Valve Choke Valve - 2 9/16"
Wellhead Single Studded Adatper Flange 7 1 / 16" x 10000 psi SSAF - 7 1/16"
The Single Studded Adapter Flanges are applied for the wellhead connection in oilfield drilling service and manufactured as per API 6A sepcification. 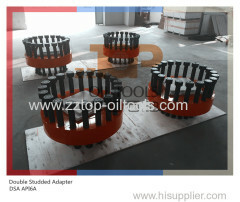 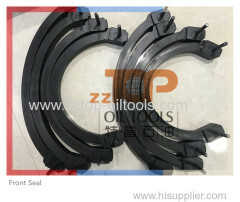 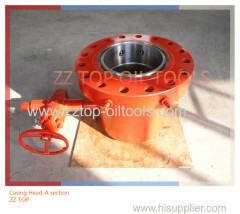 API 6A Double Studded Adapter Flange 11" x 10000psi DSA - 11"
The Double Studded Adapter Flange is confirmed with API 6A specification, applied for the wellhead connection service, working pressure 3K to 10K. 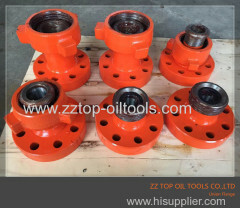 API 6A Wellhead Spacer Spool 21 1 / 4" x 2000 psi Riser Spool - 21 1/4"
API 6A Wellhead Flow Line Check Valve 3" x 6000 psi Check Valve - 3"
Wellhead Spacer Spool 21-1/4" x 2000 PSI Flange to Flange Connection Spacer Spool 21 1/4"
21-1/4" x 2000 PSI Flange to Flange Connection Spacer Spool is conformed with API 6A specification, and applied for Wellhead service in oilfield..
13 5/8" 10M x 7-1/16" 5M Double Studded Adapter is applied for wellhead equipment connection in oil & gas well operation, conformed with API 6A spec. 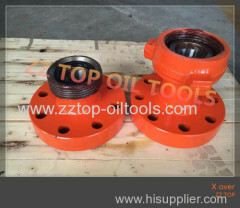 Wellhead Adapter Flange manufactured as per API6A is a combination of flanges in different sizes and pressure ratings, applied for Wellhead service. 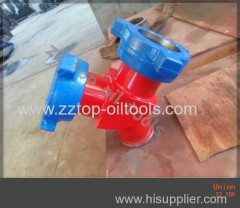 High pressure Pup joint 3" Fig 1502 is cementing and fracturing equipment delivery High Pressure Fluid Control Products, conformed with API 6A spec. 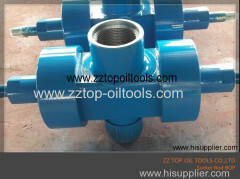 The Integral wellhead Fittings may have union ends for easy connection with various cementing or fracturing equipment, or have a welded end connector. 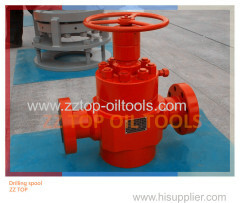 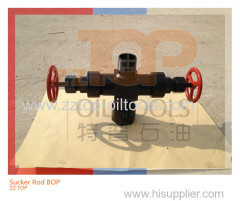 The Wellhead crossover with Flange end and union end, is conformed with API 6A specification, The X - over is used to wellhead equiment connection. 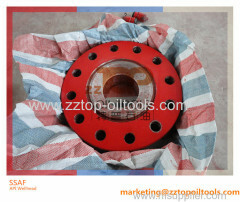 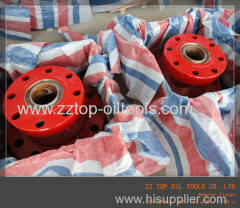 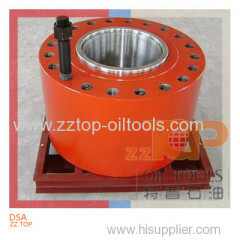 Flange adapter with one end in Flange and the other end in Union Wing and Thread,API 6A, Crossovers. 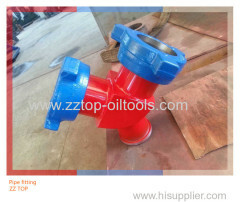 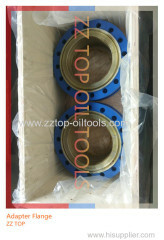 Wellhead API6A Pup Joint 2" - Fig 1502 x 15000psi Pup Joint - 2"
High pressure Pup joint 2" -Fig 1502 is cementing and fracturing equipment delivery High Pressure Fluid Control Products, conformed with API 6A spec. 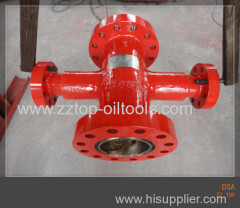 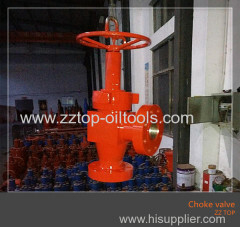 Wellhead Swing Check Valve 2 1/16" x 10000psi is conformed with API6A specification, applied for wellhead fluid control service in oil & gas well. 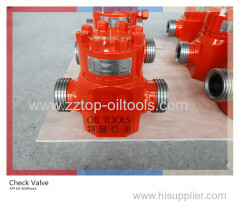 Wellhead API Dart Check Valve 2" x 10000psi Check valve - 2"
Wellhead Dart Check Valve 2" x 10000psi is conformed with API6A specification, applied for wellhead fluid control service in oil & gas well. 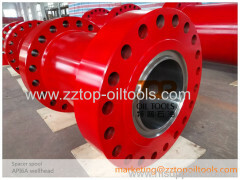 WECO Flange 2-9/16" 10M FE x 2" 1502 Wing Half for Oilfield Wellhead Weco Flange - 2 9/16"
The3" Fig 1502 Active Elbows are designed and manufactured according to API16C specification and are high Pressure Fluid Control Connection Products. 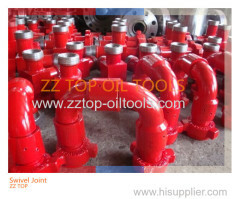 The High Pressure Integral Pipe Fittings are manufactured as per API 6A, applied for cementing and fracturing equipment High Pressure Fluid Control. 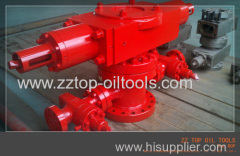 The Oilfield Wellhead Swivel joint is cementing and fracturing equipment High Pressure Fluid Control Connection Products, manufactured as per API 6A. 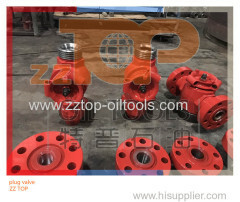 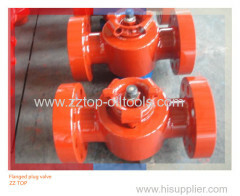 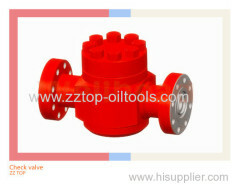 2 1/16" Plug Valve High pressure low torque Plug Valves for wellhead service Plug Valve - 2 1/16"
Wellhead No.9 Hub Clamp 11" * 3M is for the wellhead connection part of the Spool Adapter manufactured as per API 6A and 16A specification. 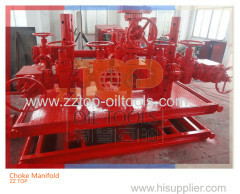 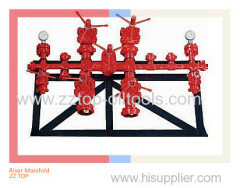 The 5000 psi Kill manifold manufactured as per API 16C spec is necessary device to control the well kick succesfully and execute the pressure control. 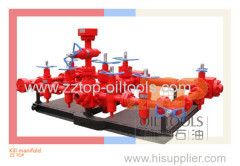 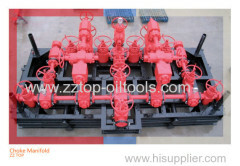 Wellhead Drilling Fluid Manifold 4" x 10000psi Drilling Fluid Manifold - 4"
Wellhead Riser Spool 18 3/4" x 15K Flange to Flange Riser Spool - 18 3/4"
Oilfield Hydraulic Operating Ball Valve Wellhead Equipment Hydraulic Ball Valve - 12"
Oilfield wellhead flanged plug valve 2" x 10000psi Plug valve- 2"
Oilfield Wellhead Flanged Plug valves are applied for connecting high-pressure manifolds during cementing and fracturing operations in oil&gas well. 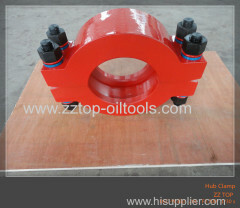 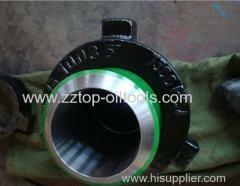 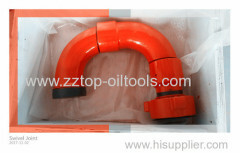 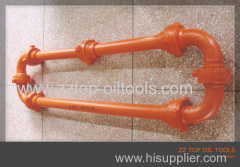 Oilfield Wellhead API 6A Tubing Head with Tubing Hanger Tubing Head - 7 1/16"
API 6A Wellhead Slip Type Wedge Casing Hanger is used for Wellhead Christmas Tree A section. 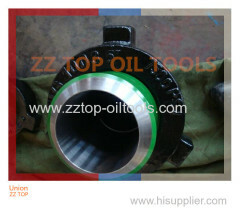 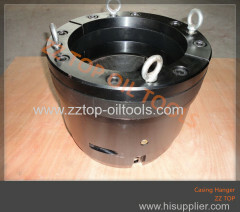 connection of casing head and surface casing in oilfield. 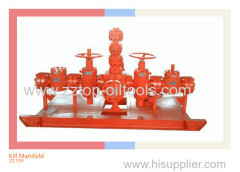 Oilfield Wellhead API 6A Tubing Head 7 1/16" x 5000psi Tubing Head - 7 1/16"
Wellhead Hammer Union 4" x 15000psi API 6A Hammer Union - 4 "
Oilfield Cameron FC Gate valve 5 1/8 x 3000psi FC gate valve - 5 1/8"
3 1/16" 10k H2 choke valve for Oil wellhead Choke valve 31/16"
Sucker Rod BOP used for 3/4" - 1 1/4" Sucker rod with pressure rating upto 3000psi, low temperature rating LU, Forged type, thread connection EUE. 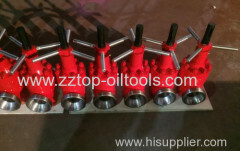 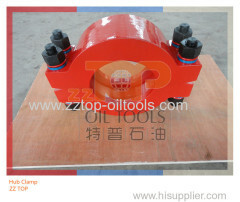 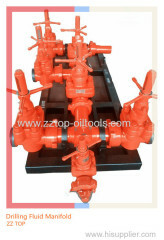 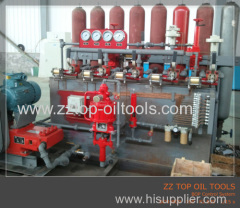 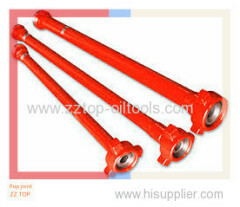 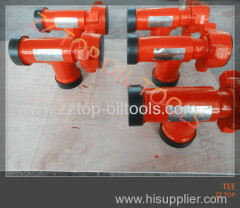 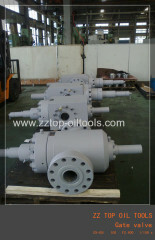 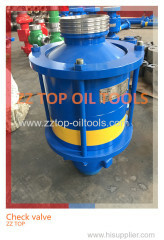 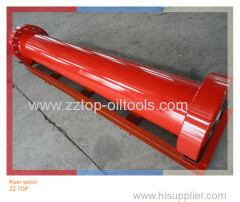 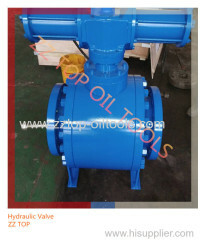 Wellhead polish rod BOP 3000 psi Polish Rod BOP 1 1/4"
Group of Well control & Wellhead equipment has been presented above, want more	Well control & Wellhead equipment and API 6A, API 16A, API 16C oilfield Wellhead & well control, Please Contact Us.